A visit to Owasippe means much more than selecting which camp to choose for your week or two weeks stay. It’s about the opportunities for fun and adventure happening all over almost 4800 acres of wilderness splendor. Whether your Scouts are first year campers or veterans of many summer camp adventures, there is always something exciting awaiting your unit members at Owasippe. Experience the Reservation and many of it's High Adventure programs in a completely unique manner. Hike and bike the trails, fish the lakes, ride the trails on horseback, try our COPE course, and much more. Fill your week with exciting new opportunities developed for older Scouts. This exciting opportunity, approved for Scouts over 14 years of age, consists of a hands on learning, care and riding experience. The program culminates in an Owasippe trail ride at the completion of the Scout's training. See parts of the Reservation on horseback. Visit the Ranch and take advantage of exciting horseback programs for Scouts of all ability levels. Trail rides are offered daily. Wrangler Outpost is offered for those who would like an overnight trail ride. Horsemanship merit badge is also offered. In partnership with Michigan Crossroads Council, Owasippe offers Mountain Boarding at Camp Gerber, which is adjacent to Owasippe. Mountain Boarding is like snowboarding, but on an off-road skateboard with wheels (and without the snow). In partnership with Michigan Crossroads Council, these two merit badges are offered at Camp Gerber, which is adjacent to Owasippe. Big Blue Lake provides Owasippe not only with beauty but also a natural resource for all boating activities. 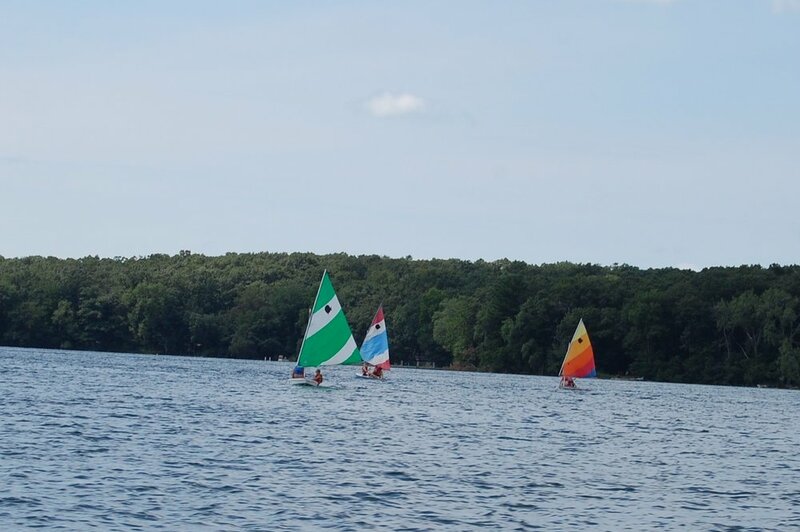 Whether it is wind, human or gas powered, you will find it at Fossett Sailing Base. Certain restrictions apply for all aquatic activities. Learn to operate a motorboat, as well as the rules of the lake, and earn Motorboating merit badge. You will have the opportunity to drive one of Owasippe’s motorboats. Develop your water skiing skills in a safe and fun environment while earning Water Sports merit Badge. Grab a friend and enjoy being pulled behind Blackhawk’s speedboat for a few laps around the lake and get a high speed tour of Big Blue lake. Saturday (Weekend) Canoe Trip. “Stay-over troops” (units that stay 2 weeks) are offered this opportunity at Owasippe. Trailers packed with canoes, paddles and PFDs are available for your troop to begin an excursion down the White River. The Charles Nagle C.O.P.E. base is your Scouts opportunity to experience a “Challenging Outdoor Personal Experience”. This program will help Scouts learn teamwork and build self-confidence. This also the home of the 30 foot high, Chris Hill climbing tower where Scouts can participate in open climbing or earn Climbing merit badge. C.O.P.E. focuses on team building activities utilizing a number of challenging ground based events. After completing the Low C.O.P.E., Scouts can then participate in High C.O.P.E. This is an elevated ropes course that consists of five challenges including an exhilarating trip down the zip line. All of these programs are supervised by trained and qualified staff. Certain restrictions apply. Cycling merit badge and guided trail rides are available at Owasippe. 23 miles of Michigan's top 10 rated mountain biking trails, located on Owasippe Scout Reservation's 4800 acres, are at the center of this exciting outpost. By participating in this program, you will have an opportunity to travel through seldom seen areas of camp and explore the wonderful and fragile ecosystem that is a part of Owasippe. What better way to capture the splendor of Owasippe’s wilderness than with a digital camera. Memories that will last a life time can be taken home with pictures and videos. Scouts will receive instruction on camera use and picture composition, and then embark on a journey where they will attempt to capture the perfect photograph or video. This is a great opportunity to sharpen your photo taking skills while earning Photography or Moviemaking merit badge. Take a guided fishing trip on Owasippe’s pontoon boat. 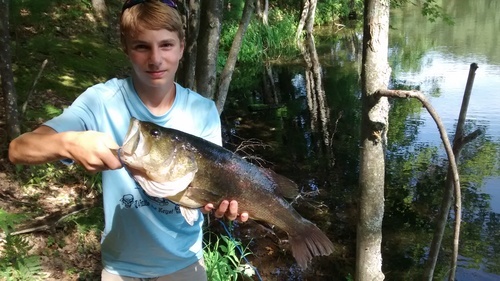 Catch the big one on Big Blue Lake. Fishing Outpost is open to both Scouts and Leaders.